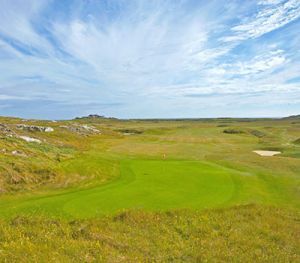 The Eddie Hackett designed Connemara Golf Links is situated between the Twelve Bens Mountains and the Atlantic Ocean. There are only 150 links golf courses in the world, and Connemara is acknowledged to be one of the finest examples. This links is located in one of the most splendid settings in the world. Golfers who discover Connemara invariably return to its charm and challenge again and again. 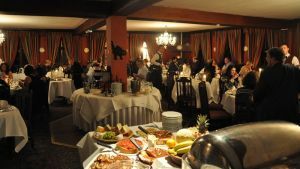 If you like seafood don’t pass up the opportunity of eating in the restaurant. If there was a course like this on the west coast of England it would surely host the British Open". Peter Alliss, Ryder Cup player, renowned golf writer and BBC golf commentator. Classic links land was in evidence at the fourth, where one could hear the sea breeze whistling through the reeds surrounding a lake to the left. And we went on to retrace Hackett’s steps along the fifth and sixth, to the sound of a lone lark singing it’s little heart out overhead". Dermot Gilleece, when Irish Times Golf Editor. Connemara comprises of 27 of the best links you will find anywhere and has a fine tradition of producing top amateur golfers. The visitor is assured of the warmest of welcomes and a memorable round of golf at Ballyconneely. Tom Watson visited Connemara Golf Club in the millennium, the year he was captain of Ballybunion where he recorded a score of 69 around this tough golf course. Offer available Sunday-Thursday for a minimum stay of 2 nights. 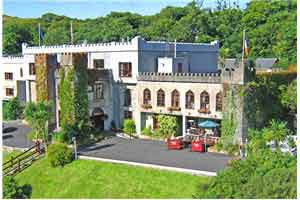 Our spacious Standard rooms are located in the castle itself. Each room offers either a double bed or twin beds sleeping a maximum of two people. Full Irish Breakfast included. Please specify in Special Requests Box whether you require a Double or a Twin Room. From €229. Green Fees April to October. David Mortimor won the IPGA Championship in 2010. Kenneth Fahey was selected on the Connacht team for the Interprovincial Matches played at Portmarnock Golf Club from 11th to 13th August 2004. Connemara Golf Club won the Connaught final of the Barton Shield and were drawn against Ulster Champions Banbridge in the All-Ireland Semi-Finals at Lisburn Golf Club on 11th September 2003. The team on the day was Derek McNamara with Ger O'Donnell and David Scully with David Stapleton. Banbridge went on to win the All-Ireland pennant by beating Stackstown by one-hole in a gripping final. Connemara won the Connaught final of the Barton Shield when they beat Athenry. They went on to meet Shandon Park in the All-Ireland semi-finals at Lahinch on 21st September 2000. The squad was Derek McNamara, Kenneth Fahey, David Mortimer, Ger O'Donnell, Dave Scully, David Collins and David Stapleton. They went down by only one hole to a very b Shandon Park in the Semi-Finals. The team was D. McNamara with K. Fahey and D. Mortimer with G. O'Donnell. Connemara Golf Club won the Connaught Irish Senior Cup in 1998 when the team was, David Mortimer, Derek McNamara, Kenny Fahey, Michael Galvin, David Collins, Ciaran Smyth, Ger O’Donnell, John McLaughlin and Nigel Howley. Derek McNamara was runner-up in the West of Ireland Championship at Co. Sligo on the 2nd April 2002 and was selected on the Irish team that played Wales at Ashburnham on the 27th April 2001. Derek McNamara won the Irish Boys' Amateur Close Championship, by five shots at Strandhill on 25th August 2000. He finished with a fine score of 268 shooting a course record 61 in the process. Derek was selected on the Irish team for the World Junior Championship in Hyogo, Japan, in June, 1999 and played in the European Amateur Team Championship at Uppsala, Sweden, in July, 1999, and represented Ireland in the Boys' Home Internationals at Conwy G. C., Wales, in August, 1999. Tara de Courcey was selected on the Connaught Ladies team for the AIB Interprovincial Championships at Mount Wolseley Golf Club from August 7-9 2002. Kenny Fahy was selected on the Irish Boys team for the Home Internationals at Moortown, Leeds in August 2001. Kenneth Fahey and Derek McNamara were selected on the Boys' Home International at Portmarnock G. C. on August 9th to 11th 2000. Kenneth Fahey played Connaught Boys in 1998, 1999, and 2000. They won the Connaught Shield in 1981. Connemara won the Connaught Senior Cup in 1998, beating Co. Sligo in the final at Athlone G. C.
Connemara Championship Golf Links was opened on 7th June 1973. The first professional Tournament held by the club was the Carroll’s Irish Matchplay Championship in 1980, which was a great success. The annual Connemara Pro/Am held in September is now a well-established fixture on the Irish PGA calendar. The Championship Links Par of 72 were designed, by the late Eddie Hackett. 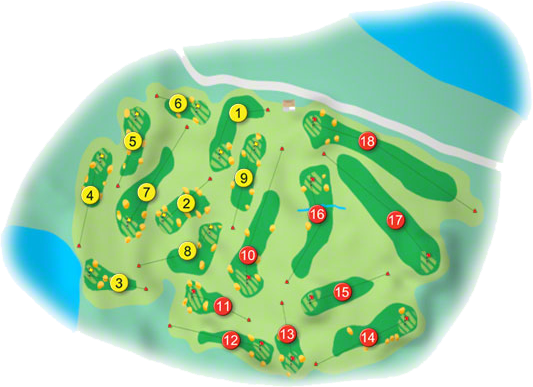 The recently, developed New Nine holes were also designed by Eddie Hackett and his successor Tom Craddock. The integration of the third nine into the original course is an example of the foresight that a well-established club like Connemara has! The reputation that Connemara Championship Links has built over its 30-year existence can be attributed to the members who support it and the staff that maintain and administer it.